Hello guys, this is the last day of the Month and I have decided to reward the Top commentator for 2018 with a Free Airtime. Like we Promised, we will be rewarding the user who contributes often to this blog with huge prices and even Premium Services for Free. It is always advisable to comment on any blog post after reading rather than leaving the site with a trace. Your little comment which takes just 5 secs can really make you be winning and also popular on UcheTechs Blog. This is a very Big Technology Blog In Nigeria and especially worldwide, so don't ruin your chance of being Featured here. This month being May 2018, there haven't been much comments and contribution from my reader but we had our biggest Traffic peak this month. There is a user who manages to support this blog by commenting, although not frequently but he is the highest and is comment is really encouraging and helpful. 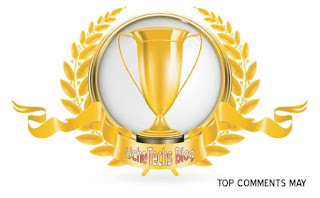 Kobi Hanson is the true winner of this month's award of being the best and Top commentator on UcheTechs Blog. I will like to thank you for your lovely and encouraging comments on this blog sir, they are really helpful. To show my appreciation, this is what I will reward you with. Kindly Drop Your Number below the comment section to receive your Free Airtime and don't forget to drop your desired Paypal email address. This is a welcome gesture from you, Uche, and congrat for your traffic spike!